When Henry II refused to name his eldest son Richard as heir to England and Normandy, Richard allied with Philip II of France, and soon defeated Henry, who died two days later on July 6, 1189. Richard had finally inherited the crown, but he was eager to join the Third Crusade, and reclaim the Holy Land from Saladin. A crusade would be insanely expensive but squeezing revenue from his territories of England, Normandy, Anjou and Aquitaine proved easier than arranging a treaty that would allow both Richard and Philip to go on crusade without fearing that the other would take advantage of the situation to attack. More troublesome was his younger brother John, who clearly lacked either the martial ability or the plotting skills required to seize the throne directly but might try his luck if Richard would be absent for months or even years. England would be administered by William Longchamp as chancellor, supported by four co-justiciars, including William Marshal, while John was forced to swear that he would not enter the kingdom for three years. Richard’s mother Eleanor was not officially regent but the justiciars knew that they were expected to defer to her advice.After a tremendous amount of organization, the English and French kings left in the summer of 1190. On the way to Palestine, Richard announced that his nephew Arthur of Brittany was his heir, which drove John to break his promise and return to England in 1191, where he seized castles and attempted to overthrow Richard’s chancellor. When Prince John (Claude Rains) learns that his brother King Richard (Ian Hunter) was captured by Duke Leopold of Austria on the way back from the Holy Land, he appoints himself regent, supported by Norman lords who embrace the opportunity to oppress the Saxons. To his surprise, he is opposed by Sir Robin of Locksley (Errol Flynn), whose merry impudence impresses John, until he vows to organize a revolt that will overthrow the prince. Robin rouses up a small army of men who have been tortured or had their farms burned. Norman leaders are killed and he evades pursuit by disappearing into Sherwood Forest. 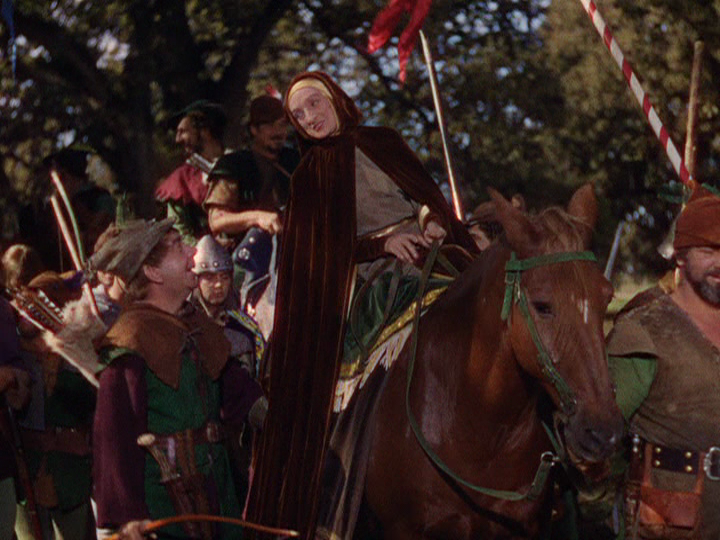 When Sir Guy of Gisborne (Basil Rathbone) escorts Marion (Olivia de Havilland), a royal ward, to an abbey, the party is ambushed by Robin and his followers, the Merry Men, led by Mulch the Miller (Herbert Mundin), John Little (Alan Hale, Sr.), Will Scarlet (Patric Knowles) and Friar Tuck (Eugene Palette). Shocked that Robin has given refuge to poor villagers and will send money taken from John to ransom Richard, Marion slowly falls for his charm. The Sheriff of Nottingham (Melville Cooper) suggests an archery torunament to lure him out of the forest, and the scheme succeeds despite the warnings of his men who rightly suspect a trap. 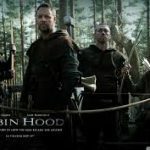 Learning that Robin has been sentenced to be hung, Marion contacts the Merry Men at their favorite tavern, and plans Robin’s rescue. Meanwhile, John discovers that Richard has returned to England with a few companions, so Gisborne suggests that they arrange Richard’s death. 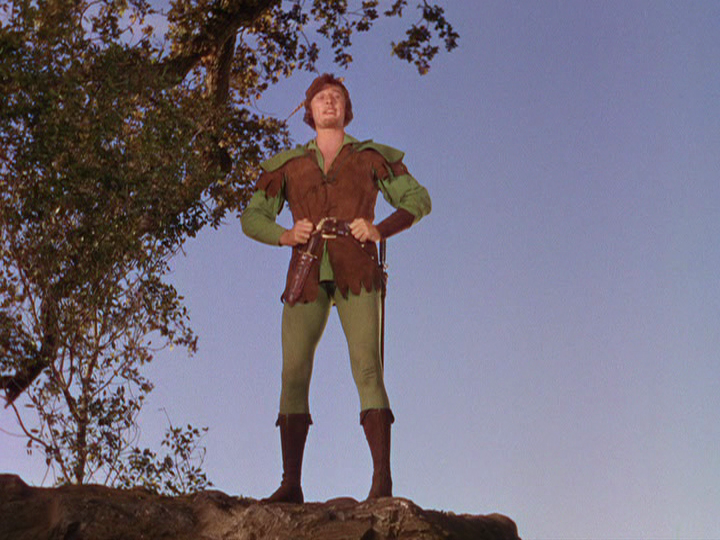 Posing as a monk, Richard allows himself to be caught by Robin in Sherwood Forest. Determined to rescue Marion and prevent John’s coronation, the Merry Men dress up as monks to sneak into the castle. After Richard reveals himself, John and his followers are banished from England, and he then swears to banish conflict between Normans and Saxons. Robin is then made an earl, and told to marry Marion. 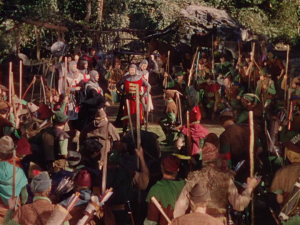 There is little historical detail in The Adventures of Robin Hood, other than good King Richard went on crusade, but was captured on the way home, so bad Prince John seized the throne, which is…mostly true, although there was no large-scale peasant revolt. The film opens with the statement that when Richard left England in 1191 to drive the infidels from the holy land, he placed the kingdom in the hands of his friend Longchamp, instead of his brother John. Although it is not mentioned, Richard spent much of his time fighting fellow Christians on the way to Palestine. The script is correct that England would be administered by William Longchamp as chancellor, supported by four co-justiciars. Richard’s mother Eleanor was not officially regent but the justiciars knew that they were expected to defer to her advice. Possessing the three offices of papal legate, justiciar and chancellor, William Longchamp was incredibly powerful, and should have been immune to John’s schemes. Unfortunately, while devoted to Richard, he was also determined to enrich himself, and his overbearing nature made enemies of important English magnates. When Richard was captured by Duke Leopold of Austria, John saw an opportunity to seize the throne, so he hired Flemish mercenaries, and returned to England to gain support from the barons, but he was opposed by Eleanor, Geoffrey of York, and William Marshal. When the first of his mercenaries reached England, they were either killed or imprisoned, so the rest returned home. However, John was still too powerful to be imprisoned, and if Richard was never released, he would become king, so Eleanor arranged a truce with him, promising to return his castles if Richard was not freed within a period of time. The barons are united behind the screen John, which is an exaggeration, his wealth won support, but few real followers. In fact, the Norman lords of Normandy bluntly refused to serve John. The story is dominated by endless talk about the Norman-Saxon conflict. Honestly, it is difficult to know whether that is accurate or not. The idea of Robin Hood as a Saxon champion against the Norman occupiers was originated by Sir Walter Scott when he wrote the historical novel Ivanhoe in 1819. Unlike previous invaders like the Danes, who had worked with local leaders to weaken opposition, when Duke William of Normandy conquered England in 1066, he imposed his followers as the new ruling class of England, and they largely married amongst themselves, creating an Anglo-Norman nobility that possessed lands in both England and Normandy. However, most of the written accounts from the period were produced by churchmen, since the vast majority of the population was illiterate, and they did not discuss the issue. Ignoring the fact Richard ruled half of France as well, and cared far more for Aquitaine than England, the script focuses on England. Unaware that he is speaking to the king, Robin condemns the crusade because it stopped Richard from defending England. A key plot point is that Richard has secretly returned to England with only a few followers, therefore John has a heaven-sent opportunity to make his temporary seizure of the throne permanent. However, when King Philip of France learned that the real Richard would soon be released, he sent a message to John: “Look to yourself. The Devil is loosed!” John did just that, and fled to Paris. Unable to stop plotting, he wrote to numerous barons, seeking support, until an exasperated Eleanor convinced the regency council to confiscate his estates. Richard was released on February 4, 1194, after fourteen months in captivity. After journeying through the Angevin lands on the continent, he returned to England for a month, where he was greeted with surprising warmth despite the huge ransom, likely because the alternative was John. John responds to Robin’s open declaration of revolt by seizing his castle and signing his death warrant. The seizure of the castle is not shown but in reality this would have been a huge event, impoverishing not only Robin but presumably his entire extended family and their followers, who may not have shared his willingness to live in the forest. 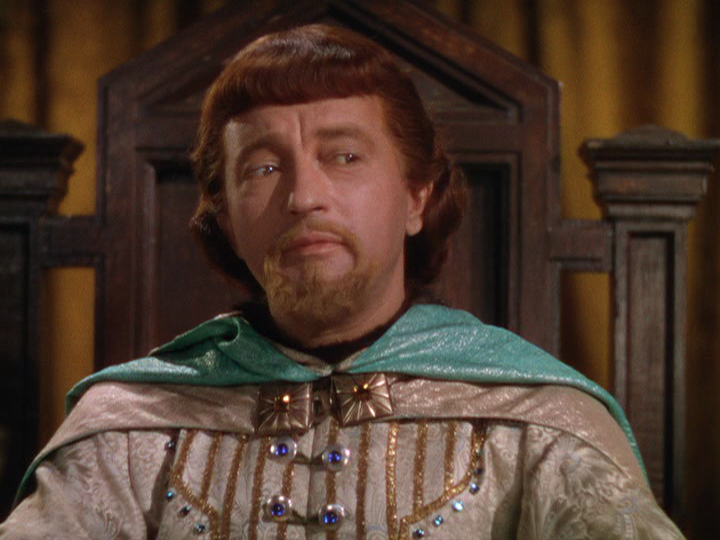 Following the success of Captain Blood (1935) and The Charge of the Light Brigade (1936), Flynn was the obvious choice to play the leader of the Merry Men. Made sixteen years after Douglas Fairbanks’ Robin Hood (1922), the producers were determined to avoid criticism as a simple imitator, therefore there are few stunts in the film. 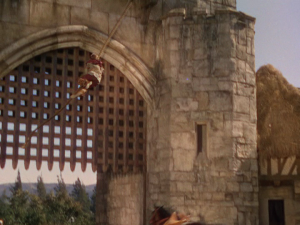 A notable exception occurs when Robin cuts the rope holding up the portcullis and then uses it to pull himself up to the top of the castle wall, but it was a last-minute decision, performed by a stuntman at the end of the filming. Moreover, the fight scenes seem sanitized of any hint of violence. Preparing to ambush Gisborne’s men, the Merry Men camouflage themselves in a huge tree and jump down on Gisborne’s men or swing down on vines and knock soldiers off their horses. 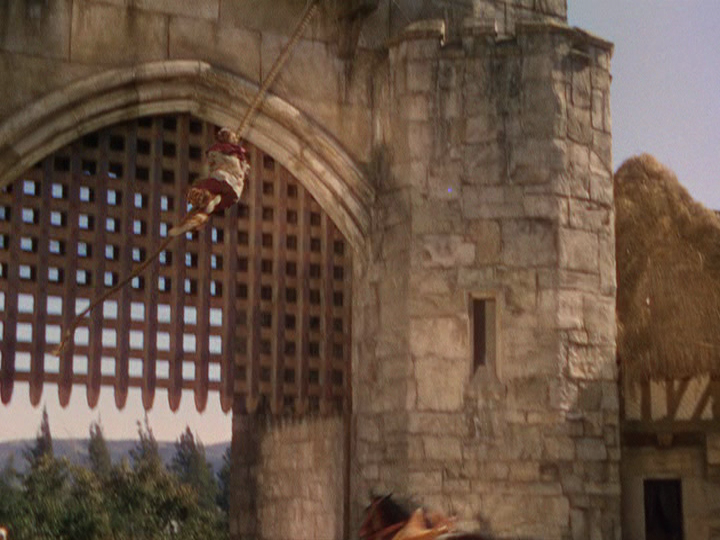 When the Merry Men dress up as monks to sneak into the castle to stop John’s coronation, it is a bit like the final battle in the Douglas Fairbanks version, but the actual reason for the scene was a simple desire to avoid the massive expense of filming an assault on a castle. One of the few connections with the Fairbanks version is the decision to cast Hale as Little John, since he had played Robin’s squire in the earlier movie. Aside from the scene where Robin does his impression of Romeo and climbs up to Marion’s balcony where she admits that she loves him, the romance between them lacks the spark that they had in Captain Blood. To be fair, I prefer Flynn and De Havilland when they are fighting, not when they fall in love. 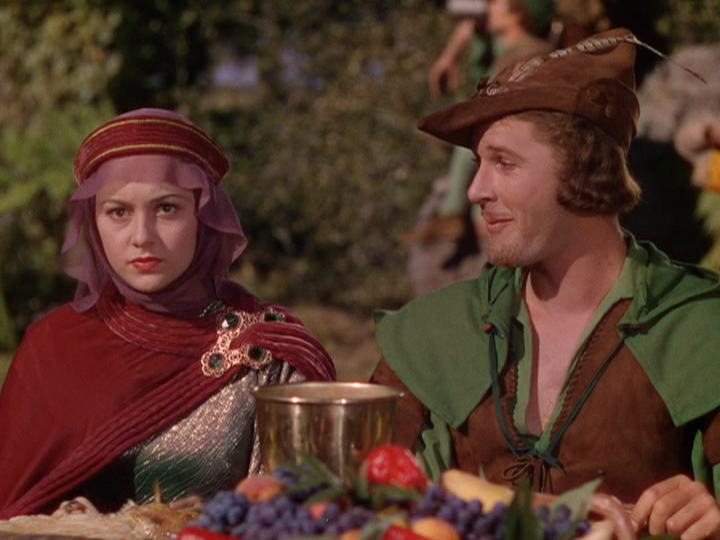 De Havilland later admitted that she fell for Flynn during the filming but chose not to give in to the temptation. Officially, he was still married, but unofficially, she probably recognized his growing problem with alcohol, and avoided a relationship out of self-preservation. However, the relationship between Robin’s follower Mulch and Marion’s fierce maid (Una O’Connor) was genuinely charming. The script drew from Howard Pyle’s collection of stories about Robin Hood, Scott’s Ivanhoe, and the popular 1890 opera by Reginald de Koven and Harry B. Smith, since Warners owned the rights to the opera, and the other two sources were public domain. However, the script was clearly influenced by Pyle’s stories, especially the scenes where Little John and Friar Tuck are recruited. 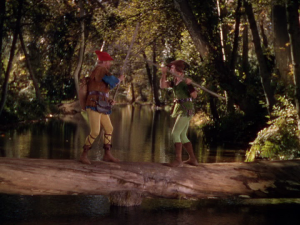 Robin encounters John Little and battles him with a quaterstaff on a log spanning a creek while Will Scarlet serenades them. After beating Robin, John happily joins the band. Mulch stops John from warning Robin that Friar Tuck is a dangerous swordsman, so Robin plays a prank on the friar with unexpected results. In addition, the entire plot to capture Robin by holding an archery contest is drawn from Pyle, although Errol Flynn’s disguise as a tinker is not very good, so it is no surprise that he is captured. 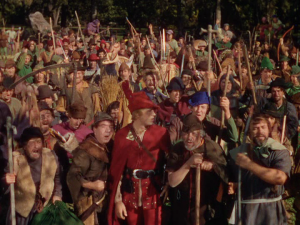 However, script devotes little time to the recruitment of the Merry Men, so Patrick Knowles’ character is actually a composite of Will Scarlet and Alan A’Dale, as if there was not enough time for a scene with each character. The outdoor scenes were shot in Birdwell Park in Chico, California, which is why everything is so bright and why the film’s version of Sherwood has some seriously vast open spaces. Honestly, the film is not as good as I remembered, which reflects the decision to switch directors during the middle of filming. Michael Curtiz was brought in on short notice after Keighley had caused delays that greatly inflated the budget. 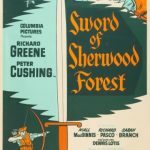 Curtiz would handle most of the interior scenes, including the swordfight in the castle, and he reshot a few of the action scenes in Sherwood forest. William Keighley had intended a more comic version, but Curtiz reduced the comedic element. The directors even used different cinematographers, therefore their respective scenes were shot according to each director’s respective style, Keighley preferred a softer approach, while Curtiz emphasized intensity. Despite the extra cost of the reshoots and production delays, the film was a massive financial success, cementing the formula of Curtiz as director and Flynn and De Havilland as romantic leads. 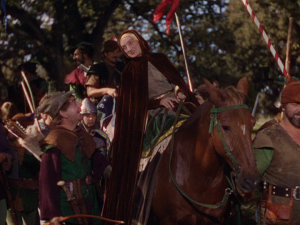 Fencing instructor Fred Cavens trained the main male cast and a dozen key extras in broadswords and quarterstaffs, and Cavens choreographed the quarterstaff bout between Robin and John that is one of the film’s standout scenes. Despite Cavens’ efforts, the swordfights are good but not great. 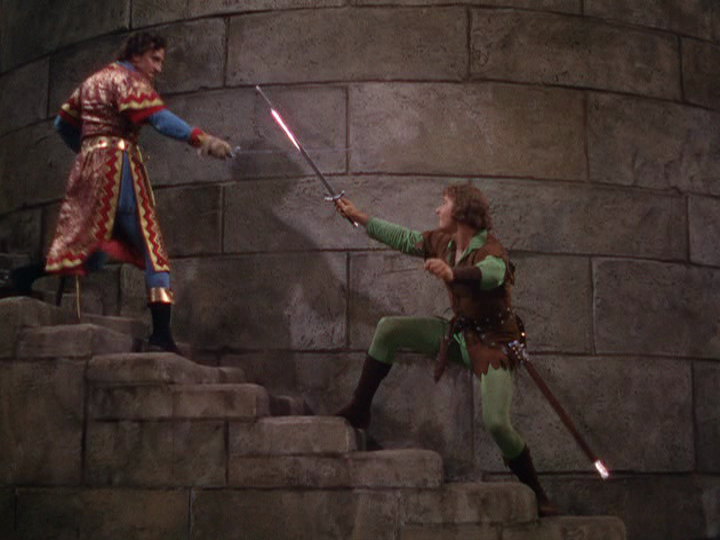 The work with shadows during the climatic duel between Gisborne and Robin in the castle hints at Curtiz’s masterpiece in The Sea Hawk (1940) two years later. Basil Rathbone had developed a genuine interest in fencing during Captain Blood, and had continued to practice, while Flynn relied on his natural physical grace and incredible ability to pose. While there were no bad feelings between the two men, their duel has a remarkable intensity, and they brought that dynamic when they worked together on The Dawn Patrol, which was made later that year. 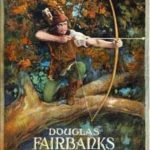 Strangely for a movie about a famous archer, the archery scenes fall flat, which is unfortunate since all of the arrows that struck the various men-at-arms were real arrows shot by archery expert Howard Hill. The stuntmen wore a layer of padding under a steel breastplate with balsa wood on top so the arrow would stick in the wood. The Adventures of Robin Hood has become the standard against which all other Robin Hood movies are measured, but it is not Errol Flynn’s best movie. 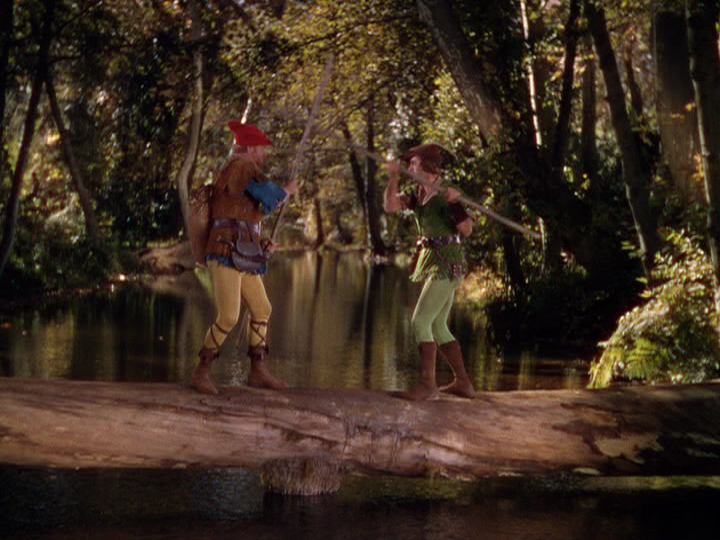 While Flynn was born to play the role of Robin Hood, the decision to switch directors during filming resulted in an uneven movie.